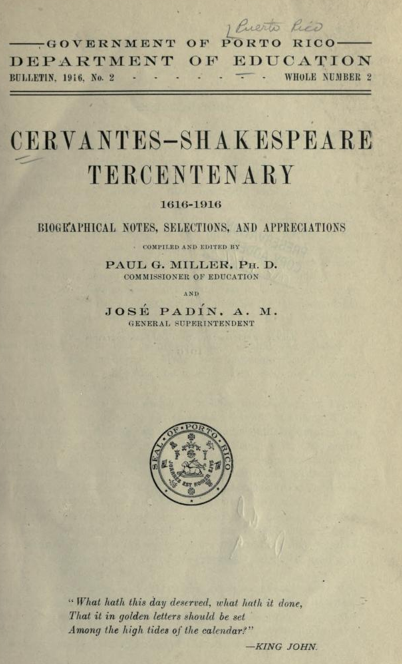 Cervantes-Shakespeare Tercentenary, 1616-1916, Biographical notes, selections and appreciations, ed. Paul G. Miller, Ph.D, commissaire d’éducation, et José Padín, A.M., surintendant général, San Juan, Porto Rico, 1916. Cervantes-Shakespeare Tercentenary, 1616-1916, Biographical notes, selections and appreciations, ed. Paul G. Miller, Ph.D, Commissioner of Education, and José Padín, A.M. , General Superintendent, San Juan, Porto Rico, 1916.